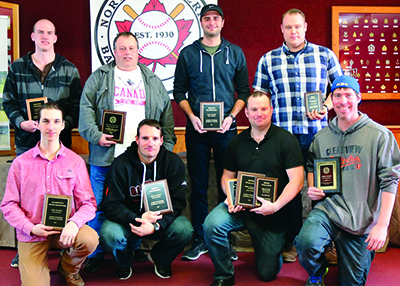 Mike Wallace and Trevor Foster were the top winners at the 2017 North Dufferin Baseball League awards held a the Lisle Legion on Sunday, March 11. Foster, who plays for the Mansfield Cubs, picked up three titles in the junior division including best batter with a .500 average, most runs scores with 19, and was named the most sportsmanlike player. Sam DeCock from Midland Twins and Brandon Peart from New Lowell Knights tied with Foster for the most runs. Peart also won the best on base percentage award with an average of .586. Nathan Lennox of the Lisle Astros won two awards taking top spot with the most home runs and was named the most valuable player sharing the award with Jordan Metz of the Mansfield Cubs. New Lowell’s Kashtin Winchester won the best pitcher title. In the senior division, Wallace of the Bolton Brewers topped three categories. He won the best batter award with a .527 average, the best on base percentage award with a .694 average and was selected as the division’s most valuable player. Brett Chater of the Bolton Brewers scored the most runs with 38 last season while his teammate Trent Barwick was the best pitcher. Cale McLean of the Midland Indians hit 14 home runs in 2017 to take top spot in the category. McLean’s performance is the best since the award was first established in 2000. Drew Huerter of the Orangeville Giants was voted the best catcher and Michael Gemmiti of the Bolton Dodgers was named the most sportsmanlike player for a third straight year. New Lowell’s Peter Kinghan was named the coach of the year. Outgoing past president Chris Esson was recognized with a plaque for his three-years of service on the executive by president Tyler Linger. Team representatives met for the annual general meeting following the awards and approved a 26-game schedule for the senior division. Newmarket requested a leave of absence dropping the senior loop to 14 teams this season. The junior division has increased to six teams with the return of Ivy from a leave of absence last season and a new entry from Orangeville. Rob Perkins was elected vice president. Jesse McIntyre will be the president with Tyler Linger moving to past president. Scott Anderson and Dan Gowan were elected to secretary and treasurer respectively. Gowan will be serving his 34th year in the position with Anderson in his 12th. Peter Kinghan was acclaimed as the statistician.